Bailey recording fish counts on waterproof paper taped to a clipboard. This year is the second year that Hurricane Island has been part of the Kelp Ecosystem Ecology Network (KEEN). KEEN is a global network of scientists who are assessing the impacts of global change on kelp forests. Kelp forests are an important ecosystem because they provide a complex habitat that supports a high diversity of marine organisms. 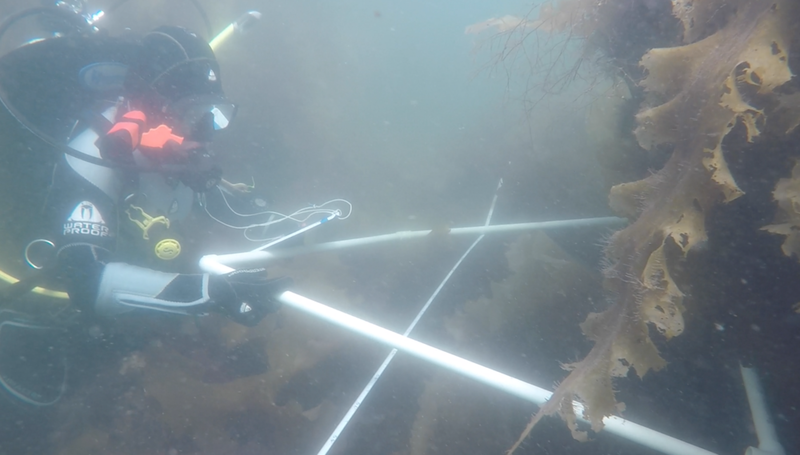 Through KEEN, scientists across the world are using a standardized SCUBA sampling protocol to observe kelp forests over time and understand how resistant they are with rapidly changing oceanic conditions. As a member of KEEN, we conduct five different protocols along four transects at each site we survey. Each protocol focuses on a different part of the ecosystem to determine abundance and percent cover of common invertebrates, algae and fish, as well as the size distribution and biomass of kelp. Last year, we surveyed one site on the north end of Hurricane Island. This year, our involvement in KEEN grew, as we added a second site on Schoodic Peninsula. Schoodic Peninsula is located further down east in Maine, and we conducted our surveys in the part of the peninsula that is Acadia National Park. In addition to the two sites we managed, we helped Northeastern University complete surveys at their site on Pemaquid Point. One exciting part about surveying multiple sites for KEEN is being able to see the changes in species distribution and ecosystem characteristics over a small distance. At Schoodic, we saw much more coralline algae compared to what is present both at Hurricane and Pemaquid. Another species of interest was Dasysiphonia japonica, an invasive filamentous red algae that originates from Japan. Dasysiphonia japonica has recently been seen in large quantities along much of the Maine coast and has been taking over areas previously dominated by kelp ecosystems. During our surveys at both Pemaquid Point and on Hurricane Island, Dasysiphonia japonica was one of the most commonly spotted species, but at Schoodic, we did not see any Dasysiphonia japonica, a sign possibly indicating that the algae has not yet invaded further down east the Maine coast. Although the protocols are the same at each site, each site felt new and exciting because we worked with different divers and saw a variety of unique species. Between all three sites, the Hurricane Island dive team completed 12 transects for KEEN monitoring in 10 different dives along the coast of Maine! 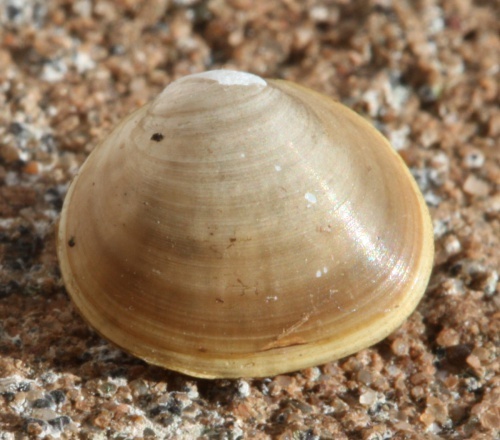 Make way for the next cohort of little bivalves! What went in last fall as the size of my fingertip now fills the palm of my hand. With an average growth rate of 0.07mm per day, our baby scallops spent the past year slowly filling up the bottom cages they were placed in. The added size means, just like for my brother and I growing up, that more personal space is needed. We have been keeping our density around 30% and the scallops are now spread throughout 4 bottom cages and 2 lantern nets. We even had a student from Georgetown join our research team for the day and help us with the time-consuming task of taking monthly growth measurements and transferring them to new, more spacious cages. The help was so appreciated! Everyone should come out and take a look for themselves! They seem to be at their peak teenage phase and very active. There is nothing like the joy on someone’s face as they watch a scallop swim for the first time or hold it in their hand while it utilizes its powerful adductor muscle to clap rapidly. Our second year class keeps on growin'! Our charismatic tiny-fauna will undergo monthly cleanings of the mesh and cage structures, as algae and barnacles grow prolifically during the warmer months. We are really starting to feel like farmers! Especially taking into consideration all the new spat we’ve collected this year, our sea farm and the gear required to make it operational are growing in step with the scallops. Our goal is to ear hang them in the fall once they’ve grown a little larger! Stay tuned. This weekend even marked an exciting field trip for a lucky handful of little scallops. Hurricane Island hosted a booth at the Chebeague Aquaculture Festival, giving visitors a chance to look a farmed scallop in the eyes and learn about our goals of research and education through on-island aquaculture. We were joined by an excellent array of speakers, growers, cooks, entrepreneurs, and enthusiastic members of the public! And while those coast-traversing scallops are safely back in their cages now, I think they may miss the taste of warm, growth-conducive water they were briefly given.